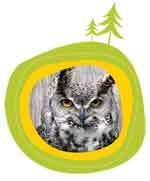 Capital City Clean Up is pleased to partner with the Wildlife Rehabilitation Society of Edmonton in an innovative program that shows children how they can make a difference in their environment. Presentation times fill up quickly. To book your presentation, email the Wildlife Rehabilitation Society of Edmonton or phone 780-433-0884. HSBC is a proud partner of the Junior Wildlife Ambassador program. The Wildlife Rehabilitation Society can respond to injured and orphaned wildlife concerns in Edmonton.